First, let's understand what tubes are, why you would want to convert them, and where do you find them (tubes). Tubes are very similar to GIMP animated brushes, and are files used by Corel's Paint Shop Pro program with either the *.tub or *.pspshape extension. They are much like a *.png file with a transparent background. When properly converted using XnView, you can then transform them into *.gih files for GIMP. Why would I want to convert tubes into *.gih files? Because tubes are there for the taking and converting. There are thousands upon thousands of tubes on the Internet where artists have already taken an image and created brushes from them. Why re-invent the wheel, if those images are already available? It's incredibly simple to convert them, and if you don't like the images, you don't have to use them. Just use what you like, toss the rest. Where can I find these tubes you speak so highly of? For starters, you can find some that have already been converted right here on my blog. You can even visit Corel's website here and download tubes for converting on your own. Just type "psp tubes" in Google and you'll get a list of tubes and the type they are for, like flowers or angels, etc. You can even select "psp tubes sites" that will take you to various websites hosting ready made tubes. Be warned that there are websites that are no longer hosted or managed, and some are no longer in existence even though they are listed in the search. How do I convert these files? In my honest professional opinion, it is the most widely used and easiest format for converting images of all kinds. It's UI is most pleasant on the eyes, and the options (and tool design) are not complicated to understand or use. You could spend money on various programs to accomplish this simple task, but why would you want to? And to boot, it's also a batch image converter. WIN-WIN. Ok, I have XnView downloaded, now what? Find the tubes you want to convert and open them in XnView. 1. You can change the size threshold and the number of layers with the first two options on the script menu. This is important to know, if your image has more than 20 objects on a transparent background. 2. You can create the animated brush using the script without needing to perform any additional steps. Just select "Save to GIH" option. Navigate to the proper folder and name the brush. 3. You can even choose the folder location for your brushes to save it directly in the folder of your choosing. This is good especially if you are using Ofnut's Add-on Collection Manager. Just select "other" in the "Save to Folder" list to navigate using the Explorer browser. Now all that is left is to open a new image and test out the new brush! 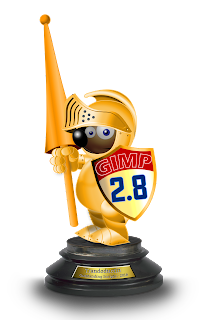 I now present, the coveted Knights of the Golden Wilber award that is awarded to coders, hackers, and scripters who take their craft above and beyond the expectations of GIMPers who use their scripts and plugins. GIMPers have a lasting appreciation for those who make our lives easier with the scripts and plugins they create for the GIMP world. Anyone can award the Golden Wilber and also accept the responsibility to properly transcribe on the award, the coder's name and award type. This list is certainly bound to get longer, as there is no shortage of talent in the GIMP world. To the coders, hackers, and scripters among us, many THANKS to you all!